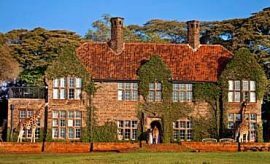 Less than 10 miles from Nairobi’s city center is Karen Blixen Coffee Garden & Cottages, the former home of the Danish author who wrote “Out of Africa”. 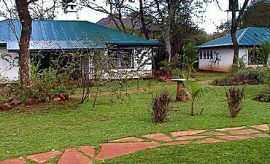 The cottage house is located in the plush suburb of Karen, 18 miles from Jomo Kenyatta Airport and around 8 miles from Wilson Airport, both strategically sited to welcome you on your safari activities in with AfricanMecca. Nestled in more than 5 acres of indigenous forest is one of Kenya’s oldest formal gardens filled with large jacaranda, cactus, bottlebrush, as well as more than 200 types of floras, delighting you with fragrant blooms, floating butterflies and hundreds of bird species at any time of year. Styled after the Swedo House that was completed in 1908 to be used as a hunting lodge and farm house, the 12 guest cottages can accommodate 30 guests, and offer yesteryear historic ambience, yet deliver modern amenities, such as fireplace, mini bar, satellite television, internet access, telephone, large bathroom with separate shower and bathtub, private verandah and 24-hour room service, and all cottages are set amidst the lush gardens. 8 of the cottages are well-suited for solo travelers and couples, and for small groups and families on safari, choose from 3 two-bedroom cottages that feature a separate lounge area. 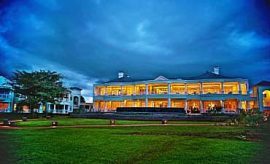 Should you be planning a romantic “Out of Africa” honeymoon in Kenya, the honeymoon suite is a private retreat with two fireplaces – one in the large bedroom and the other in the lounge area. Insect repellant is always recommended for bush and urban safari activities in Kenya, and will come in handy while staying at this or any other suburban accommodation. You should request a cottage that is far from the restaurant and bar to avoid any noise that may distract your slumber. Locals and travelers alike enjoy the meals at the Tamabo Karen Blixen Coffee Garden that features a fusion of Kenyan mainland and coastal cuisine, such as tempura queen prawns, mambrui and oyster entrees, Tamarind fish soup, kikapu kuku, samaki wa nazi to name a few of the dishes, all served with rice, ugali or varied potato options, and your preferred order to South African wine or any other beverage. The restaurant is also known for creating something that you may not expect while traveling in East Africa – flavorsome burgers – perfect for families traveling with children! For dessert, order a cappuccino or cup of tea to accompany your passion fruit sorbet, Tamambo brownie or lemon cheese cake. To enhance your culinary journey, you may dine inside the restaurant, on the veranda or poolside. Lighter snacks and oven-baked pizza are available in the bar, and the lounge is a great spot to listen to music and enjoy a shisha. 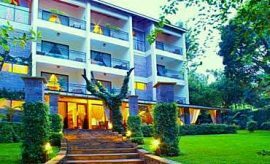 While staying at Karen Blixen Cottages, you have easy access to many of the top location attractions, such as Karen Blixen Museum, Kazuri, Giraffe Center and the Elephant Orphanage at David Sheldrick Wildlife Trust. Additionally, your AfricanMecca Safaris representative can even arrange a game tour of Nairobi National Park where you get a sampling of your thrilling safari expedition in the East African bush. 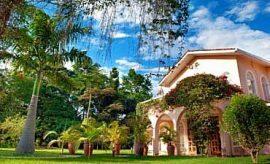 When staying at Karen Blixen Cottages in Kenya, we recommend experiencing some of the surrounding Nairobi attractions and cultural activities before heading out on your Kenya safari to Amboseli, Masai Mara and Laikipia - Lewa ending with a beach vacation and Swahili cultural tour in the exotic spice island of Zanzibar, or even Mombasa.